Q. Why do Research Areas include the school names? They are also very broad and do not seem comprehensive. Research Areas are in a tree structure with 4-7 research areas for each school. The school name appears as the parent of the research area, e.g. 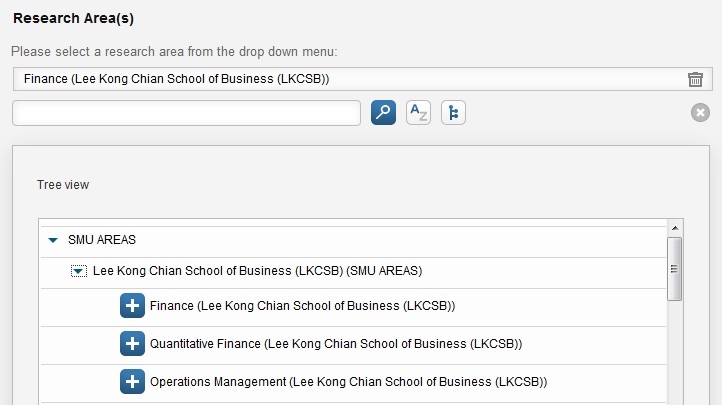 Finance is under Lee Kong Chian School of Business. We are using only the top level research area at this time. This could be reviewed in the future based on the needs of SMU.